House 1 is the mead hall headquarters of the Companions. It is located up the stairs from the central plaza in Whiterun. It was founded around the Skyforge before Whiterun even existed. The city itself built up around it. It consists of two areas, Jorrvaskr and Jorrvaskr Living Quarters. The main hall is where the Companions meet for meals and relaxing between training and missions. It consists of one large 'horseshoe' shaped table around a fire. The table seats nine persons and has an abundance of food on display: five loaves of bread, four boiled creme treats, four potatoes, two seared slaughterfish, two goat cheese wedges, an apple pie, some baked potatoes, a carrot, an eidar cheese wedge, a salmon steak, a green apple, some sliced goat cheese, a sweet roll, a tomato, and a chunk of venison. For drinks, there are two bottles of Nord mead, two bottles of wine, and one bottle of alto wine. Lastly, a coin purse can be found in between the huge amount of food. Additionally, more food is scattered around the room; starting with the lifted area surrounding the huge table; the two tables near the western entrance holds five red apples and a bottle of Nord mead, with another bottle on one of the benches in the northwestern corner. Also near the door are two food barrels with two loaves of bread on top, while another food barrel rests above the stairs leading to the private quarters. Near the stairs is a food sack next to a chest with clutter. Near the eastern entrance is a cupboard with a bottle of alto wine on top, and, in the northeastern corner, another cupboard with a loaf of bread on top, along with two food sacks. On the lower level, the northeastern corner has an end table with five bottles of ale and a set of shelves with common books and a bowl with four tomatoes on top. The adjacent table displays an apple pie, a bottle of ale and one of wine. Two bottles of Nord mead stands on a small table between two beer kegs. The southwestern corner of the lower level has another table with sweets, including three honey nut treats and three boiled creme treats, along with a bottle of alto wine. The end table next to the nearby keg holds clutter and has two bottles of Nord mead on top. Lastly, the southeastern corner has a small table with a single honey nut treat. On the south side of the hall is the main weapon display area. The fragments of Wuuthrad, several of which are missing, are placed in the middle of the wall, above which are two shields which are inaccessible. On the pillars of the stairs are four weapon plaques, three with greatswords the other with a warhammer, none of which can be taken. The cupboard her only holds clutter. To the side walls are two weapon racks, one on either side, and these weapons can be taken; an iron battleaxe, an iron greatsword, a steel battleaxe, and an steel mace. On an end table facing the fire, is the Heavy Armor skill book Hallgerd's Tale. All the items here are free to take after completing Take Up Arms. On the north side of the hall is a separate bedroom belonging to Vignar. Vignar sleeps in the southwestern bed, while his servant Brill sleeps in the southeastern. At the foot of Brill's bed is a chest with a bit of gold, a coin purse, a bottle of wine, and a bowl with five red apples. Underneath yhe table is a food sack. In the northeastern corner sits a wardrobe with random clothes, and a set of shelves with common books, two silver ingots, a draught of regeneration and a potion of cure disease. The table in the center of the room holds a mammoth tusk, a potion of enhanced stamina, a bottle of ale, a coin purse, an iron dagger, and an iron battleaxe. In the northwestern corner, opposite Vignar's bed, sits a set of shelves with a food sack, a head of cabbage, an eidar cheese wedge, a wedge of goat cheese, some sliced goat cheese, a set of clothes, a bowl with seven boiled creme treats, three bottles of ale and a poison. The cupboard holds clutter but has a coin purse and a bottle of wine and one of alto wine on top. On the floor sits a pair of boots. None of the items in this room are free to take and both beds are owned. After you have completed Battle for Whiterun and Vignar has become Jarl, all items are free to take, with the exception of the potions, the mammoth tusk, and the battleaxe. The main hallway is wide and is the nexus leading to the different bedrooms. The hallway stretches from the entrance and the Newcomer's Quarters to the south, past the rooms for the members of The Circle, all the way to Harbinger Kodlak Whitemane's Quarters to the north. The hallway itself has quite a few items as it proves a popular gathering point, especially for newcomers trying to get away from their cramped quarters. The southernmost area has a small table where Tilma the Haggard often sits, dressed with two boiled creme treats and a gourd. The two sets of shelves holds three bottles of ale, some sliced goat cheese, a head of cabbage and a coin purse. Underneath a loaf of bread is a copy of An Explorer's Guide to Skyrim. The cupboard in the corner holds clutter while another table holds three loaves of bread, a bottle of wine and another coin purse. Picking up the coin purses counts as stealing. Past the door to the Newcomers Quarters are three food barrels and two food sacks and a small table with five tomatoes. Adjacent to this table is a larger table with plenty of food, including a sliced eidar cheese, a wedge of the same cheese, five bottles of ale, an unowned coin purse, an apple pie, a tray with three potatoes and a chunk of venison, a bottle of wine and a piece og bread. Before two wings break of the hallway, a wardrobe with finer clothes, some gold and perhaps a common book. The next part of the hallway has two wings leading to private chambers of the veteran Companions members, one to the west, and one to the east. The western wing has a dinner table with two bottles of alto wine, a bowl with five green apples, a slice of bread, some sliced eidar cheese, a seared slaughterfish, a sweet roll and a tomato. The eastern wing has two food barrels, an end table with clutter, a chest with some gold and two coin purses. All items in the wings are owned, even after you become Harbinger. The room itself contains a small wardrobe with finer clothes, with a green apple and a coin purse. The door to the north leads to Kodlak Whitemane's study and quarters. This is the area reserved for all regular members of the Companions, including newcomers, and is the place you will be directed to by Farkas during Take Up Arms. In consists of eight beds cramped into a relatively small room, with four beds in the northern area and four beds in the southern. Across the entrance is a small dresser with a pair of gloves and an iron dagger on top. The northern area has two end tables with clutter and, along the northern wall, a food barrel, and a table with two carrots and a sweet roll. The southern area has a large food sack underneath the first bed on the right, followed by an end table with clutter and a bottle of alto wine on top, and a pair of boots on the floor. Above the first bed on the left is a shelf with a coin purse and a food sack. An end table separates the beds and has a few common books on top. Along the southern wall stands a cupboard with clutter and the shelves above contains two bottles of ale, and two of wine, along with a coin purse. A single set of shelves in the southwestern corner holds two bottles of regular wine and one of alto wine. This area is where most Companions sleep, and it mainly consists of beds. To the southwest is where the lower-ranking Companions and Tilma sleep; there are eight usable beds (rested bonus only). To the west are Aela and Skjor's bedrooms. Aela's is on the south, and has one unusable bed, an expert locked display case with a leveled bow and the Archery skill book The Marksmanship Lesson. On the bookshelves are four Ice Wraith Teeth, and there are some pelts on the table. To the north is Skjor' bedroom, which has one unusable bed and an expert locked display case with a steel dagger. There is a batch of Fire Salts on the shelves by the bed and three silver ingots on the shelves by the door. To the east is Vilkas' bedroom. Vilkas' bedroom has one unusable bed. There is the rare book Lycanthropic Legends of Skyrim and one sample of Ice Wraith Teeth on the shelves by the bed, nine Chaurus Eggs on the end table by the door, and some high value potions on the stand on the other side of the door. 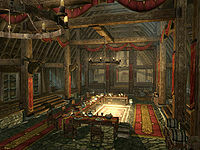 The bar contains one unusable bed used by Farkas, a lute, and unsurprisingly, a large amount of mead. The items in Aela's bedroom are only free to take through marriage; the items in Vilkas' and Skjor's bedrooms, and around the bar are never free to take. The items in the hall and the communal bedroom are free to take after completing Take Up Arms. The Harbinger's quarters consists of a bedroom and a study. The study contains four display cases, three of which are locked by expert locks; the other is located atop a set of shelves, and is not locked. The three locked cases display a dagger, a warhammer, and a greatsword (all leveled). The non-locked display case is empty. On the map table is a Giant's Toe and the Two-handed skill book Song Of Hrormir; on the end table beside that table is a Daedra Heart. The bedroom contains one unusable bed and an Unusual Gem. All ingredients respawn. Everything here, including the bed, becomes free to take after completing Glory of the Dead. 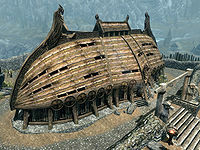 There are no known safe containers in Jorrvaskr. Jorrvaskr's doors lock during the Battle for Whiterun quest. The locks cannot be picked ("You need a key"), and any members or quest items inside are inaccessible. The doors unlock sometime before the end of the following quest, Rescue from Fort Neugrad, or Reunification of Skyrim if you have sided with the Imperials. When you complete a Companions job and want to enter Jorrvaskr to finish the quest, the map marker will actually point you to the back doors. However, the Sheild Sibling who gave you the quest will be standing closer to, and even facing, the front doors, fully expecting you to enter through them instead. This page was last modified on 23 June 2013, at 12:29.